Additional resources in the Practice Planners ® series: Progress Notes Planners contain complete, prewritten progress notes for each presenting problem in the companion Treatment Planners . Homework Planners feature behaviorally based, ready-to-use assignments to speed treatment and keep clients engaged between sessions. For more information on our Practice Planners ® , including our full line of Treatment Planners , visit us on the Web at: www.wiley.com/practiceplanners ARTHUR E. JONGSMA, J R. , P H D, is the Series Editor for the bestselling Practice Planners ® . Since 1971, he has provided professional mental health services to both inpatient and outpatient clients. He was the founder and director of Psychological Consultants, a group private practice in Grand Rapids, Michigan, for 25 years. 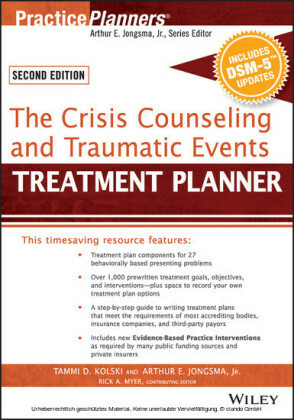 He is the author or coauthor of over 50 books on treatment planning and has conducted training workshops for mental health professionals around the world. K. DANIEL O'LEARY, P H D, is a Distinguished Professor of Clinical Psychology in the Department of Psychology at Stony Brook University, State University of New York. His current research focuses on physical and psychological aggression in intimate relations and factors in marriage that lead to clinical depression. RICHARD E. HEYMAN, P H D, is a Research Professor of Clinical Psychology in the Department of Psychology at Stony Brook University, State University of New York. Dr. Heyman's research program focuses on the development and maintenance of family problems. Pressure from third-party payers, accrediting agencies, and other outside parties has increased the need for clinicians to quickly produce effective, high-quality treat-ment plans. Treatment Planners provide all the elements necessary to quickly and easily develop formal treatment plans that satisfy the needs of most third-party payers and state and federal review agencies. 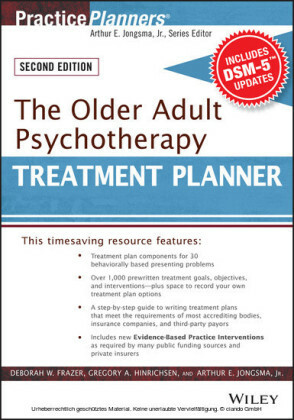 Includes over 1,000 clear statements describing the behavioral manifesta-tions of each relational problem, and includes long-term goals, short-term objectives, and clinically tested treatment options. 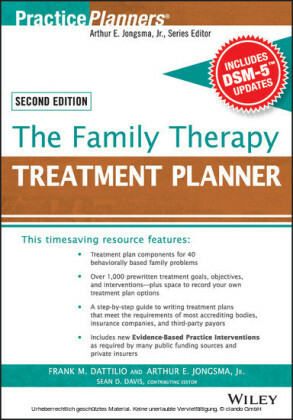 Has an easy-to-use reference format that helps locate treatment plan compo-nents by behavioral problem or DSM-IV-TR diagnosis. As with the rest of the books in the Practice Planners ® series, our aim is to clarify, simplify, and accelerate the treatment planning process, so you spend less time on paperwork, and more time with your clients. This second edition of the popular Couples Therapy Treatment Planner comes as a result of the positive response that we received over the past decade with the success of the first planner. The first edition, which ran for almost 10 years, was a bestseller. As a revision, we have included three new chapters (Internet Sexual Use, Retirement, Transition to Parenthood Strains) and separated the intimate partner violence (IPV) chapter into two, one covering bidirectional IPV and one covering "intimate terrorism" IPV. All chapters, totaling 32 in all, were updated to include research and clinical developments over the last decade and to indicate evidence-based treatment interventions throughout. The cornerstone of early behavioral marital interventions was clearly on decreasing negative interchanges and increasing positive interchanges between partners (Jacobson & Margolin, 1979; O'Leary & Turkewitz, 1978) because dis-cordant couples differ from happy couples in positive and negative interactions (Broderick & O'Leary, 1986; Johnson & O'Leary, 1996; Wills, Weiss, & Patterson, 1974). Studies based largely on these foci showed that significant increases in marital satisfaction could be obtained, but it also became evident that, while there were significant improvements, there were many couples who needed more specific assistance in dealing with various and often long-standing problems. 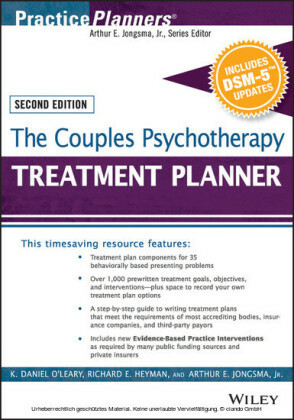 In fact, this Couples Therapy Treatment Planner is organized around various problems that often coexist with relationship problems, and each chapter provides up-to-date references related to the numerous and varied problems that often occur simultaneously with relationship problems.